Once upon a time there was a lonely bowl of plain oatmeal. Just kidding, this ain’t no fairy tale. But, after eating this “Apple-y Ever After Oatmeal” I can assure that you will be tOATally satisfied. See my featured (vegan) recipe on Millennial-Kitchen by clicking here. Millennial Kitchen is a food evolution revolution from fast, unhealthy food to a whole-food, plant-based, healthy diet. Join the revolution and follow #millennialkitchen on Instagram! 1. Heat oatmeal, granola and milk on low-med heat in a small pan on the stove; stirring occasionally. 2. Meanwhile, heat a small saucepan over medium heat, add a little butter and toss in apple slices. 3. Mix brown sugar, cinnamon and nutmeg together then sprinkle evenly over the apple slices (flip apples to coat both sides). 4. Cook for 4 minutes, then add one tablespoon of lemon juice to the sauce pan and caramelize the apples for another 3 minutes until fully glazed. 5. Drizzle honey into your oatmeal before removing from heat. 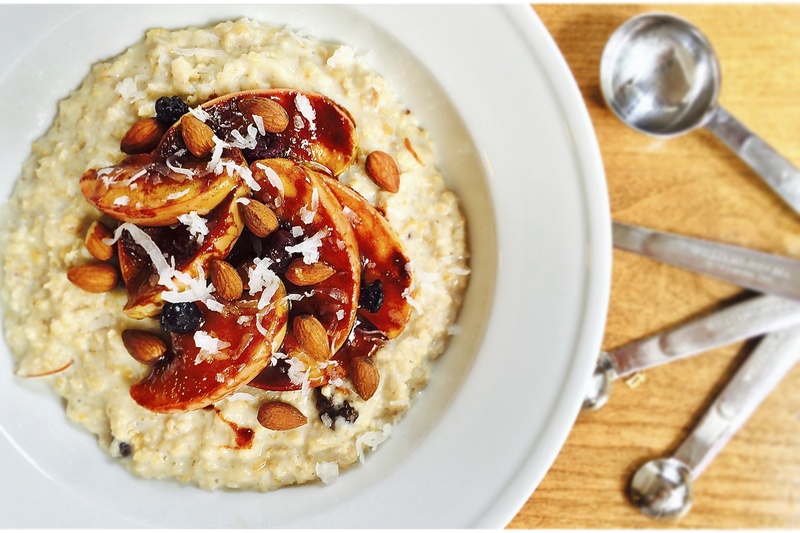 Top your oatmeal bowl with the caramelized apples, and optional toppings such as almonds, dried fruit and shredded coconut. Bon appétit! Next Post Coo-coo for Cocoa Muffs!